Running a business and changing the world is so exiting. Time flies and we often don't take the time to cook fresh meals. However, there are hundreds of possibilities to cook simple, healthy and tasty - yet even cute - recipes everyday. So please, forget the pasta sauce you used to buy in the supermarket, at least once, and try this easy and flavourfull recipe. The cherry tomatoes are the perfect choice, because they are sweet, and so cute. You can use small cherry tomatoes, or if you don't have those ones, you can use big cherry tomatoes and simply cut them in half, or in quarter. They should all be the same size, to roast evenly. That's all. You can also use common tomatoes, which are not sweet, and simply add a pinch of brown sugar. Forget the tomatoes that are not red, I mean deep ripe red, because even if you add some sugar, they will be flavourless. I roasted the little cherry tomatoes at 140°C (275°F) during 20 minutes. Depending on how you've cut your tomatoes, this time may slightly vary, so let's have an eye on it while cooking. Click to Tweet: "Always have an eye on your pans and oven while cooking. It's like dancing salsa, you want to have on eye on your partner". It counts also for the roasted pine nuts + you will have to stir them frequently so that they roast evenly. In this recipe I recommend to roast the pine nuts in a pan, and not in the oven with the tomatoes. The humidity generated by the tomatoes will be too high and soften the pine nuts. I would love to know if you'd like this recipe. Feel free to tell me in the comment section below, and if you liked it, please share the love with your friends and family, and subscribe to my weekly recipe update via email (top right subscribe button on the blog). In the meantime, I'm so happy to tell you that I'm going to join the online B-School 2015 with Marie Forleo. It's been only one month I know her and she's inspiring me so much. 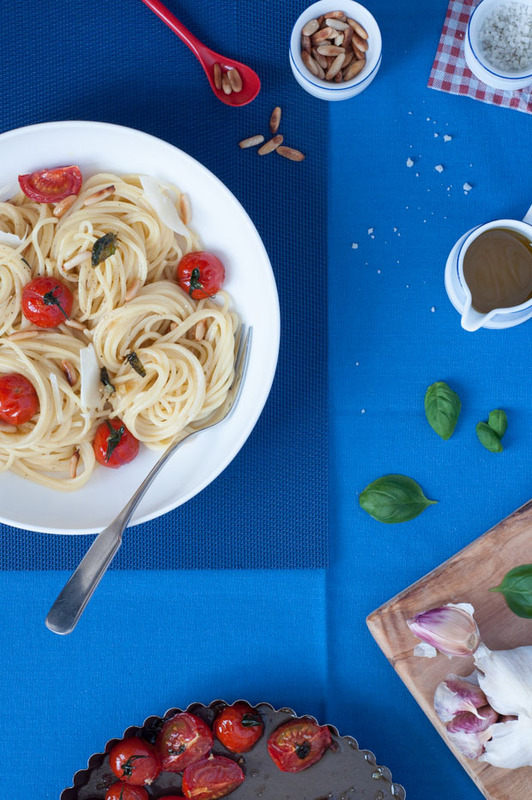 A 30-minutes tasty pasta recipe made with fresh roasted cherry tomatoes, pine nuts, basil, garlic and plenty of olive oil. On a roasting plate, put together the tomatoes + garlic + basil + olive oil + a pinch of salt. Make sure all the ingredients are well coated with the oil. Cook in the oven for about 20 minutes. After about 10 minutes, sprinkle the tomatoes with cooking olive oil. Add the pasta and cook, stirring occasionally, until al dente. Add the roasted ingredients, tomatoes, garlic and basil, including the tomato-garlic-basil infused olive oil. Stir gently. Add the parmesan cheese, roasted pines and some fresh basil. Salt and pepper to taste. Servir aussitôt !